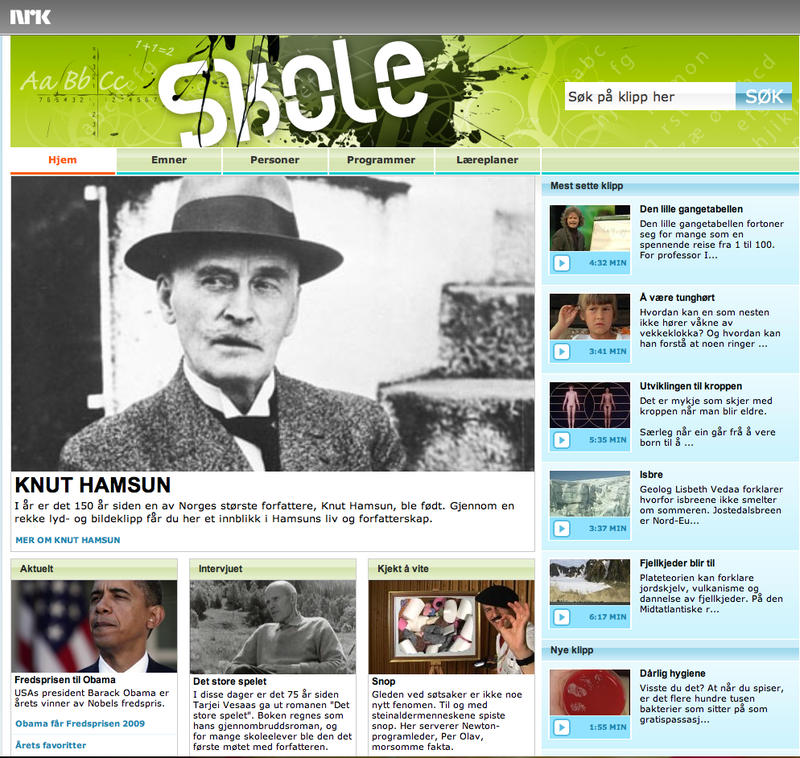 NRK/Skole is an educational site for school children publishing sound and video clips from the archives of the Norwegian National Broadcasting Company, the Norwegian equivalent of the BBC. A team of editors scour the archives to find suitable content, then cut it into clips suitable for use in an educational setting and attach metadata to these clips. The content ranges from interviews with historical figures, clips from the daily news, documentaries, and even comedy gags. All clips on the site are represented as topics in the topic map, and associated with topics representing people and subjects that the clips are about. In addition, clips are also attached to the programs they were taken from, providing three navigational entry points into the portal: person, subject, or program. In addition, clips are connected with knowledge goals taken from the national curriculum, which has been published as a topic map by the Ministry of Education. Thus, teachers can navigate the curriciulum for their subject to find clips supporting any particular knowledge goal in the curriculum. Unfortunately for non-Norwegian readers, the site is all in Norwegian. However, some of the content is in English, such as Winston Churchill's famous blood, sweat, and tears speech from World War II. The site runs on Ontopia 5.0.0, the Resin web server, and uses the Polopoly CMS for articles. The Ontopoly editor is used to tag clips against the topic map, while the DB2TM module is used to import metadata from a relational database. The presentation is implemented using the JSP tag libraries.